When the SoundStage! Network covered the 2007 Consumer Electronics Show, Jeff Fritz noted that quite a few companies were showing off loudspeakers priced in the megabuck range. This is good for the audio industry -- it suggests that there is a market for even the most expensive hi-fi -- but it doesnt reflect the equipment owned by the vast majority of consumers. How many people do you know who own a pair of speakers worth over $1000? Now, how many own an Apple iPod? Im willing to bet that the second number is quite a bit bigger than the first. Fortunately, there are many more speakers at the affordable end of the price spectrum, where most of us shop, and some of them are surprisingly good for the little they cost. One example is PSBs Alpha B1, one of the newest speakers from designer Paul Barton. It might not look like a piece of audiophile jewelry, but in terms of sound, at $279 USD per pair, this little speaker has a lot going for it. The original Alpha, introduced in the early 1990s, helped further PSBs reputation for making inexpensive speakers that sounded as if they cost a lot more. PSBs success was due to Paul Bartons insistence that every speaker he designed meet four criteria: 1) accurate reproduction of a wide dynamic range and frequency response, 2) even tonal balance, 3) realistic imaging, and 4) high efficiency and good power handling, to work well with similarly priced electronics. Although the Alphas comprise PSBs entry-level series, the technology incorporated in these models demonstrates how much thought has gone into their design. The B1 measures 11.875"H x 7.06"W x 9.5"D, weighs 8.8 pounds, and is wrapped in a vinyl veneer simulating black ash, maple, or sienna. Theres a port on the rear, and the speaker is magnetically shielded for use near a video monitor. The B1s side, top, and bottom panels are made of MDF, the front baffle and rear panel of thick plastic. Five-way, gold-plated binding posts allow connection with spades, bananas, or bare speaker wire. A keyhole slot on the rear can be used for mounting the B1 on a wall, while a threaded insert on the bottom can be used to attach the speaker firmly to a stand. The aluminum front grille isnt easy to remove with the fingers, but can be pried off with the aid of something small enough to slide under its edges. All of my listening was done with the grilles in place. The B1s frequency response is rated at 65Hz-21kHz, ±3dB, with a -10dB cutoff at 55Hz. Its anechoic sensitivity is claimed as 89dB, its nominal impedance 6 ohms (with a 4 ohm minimum). Such numbers mean that the B1 wont need too many watts to be powered to appreciable volume levels. My guess is that 50W should be adequate for most listening. The Alpha B1s found their way into a review system consisting of a Simaudio Moon 5.3 CD player connected to an NAD C372 integrated amplifier via AudioQuest Copperhead interconnects. The speaker cables were from Ultralinks Challenger series, terminated in banana plugs. At $279/pair, a cabinet volume of 8 liters, and only a single 5.25" woofer to deliver the low frequencies, I couldnt expect the Alpha B1 to work such miracles as shaking me in my listening chair with awesome bass. Its just not possible. What the B1 did do was deliver bass in a way that conveyed good definition and good speed while keeping the sound tight. And while it couldnt play down into the deepest regions, to the B1s credit, it didnt try, and thus risk sounding bloated. By respecting their limits they always sounded controlled, and made up in clarity what they lacked in weight. Still, that lack of deep bass is the B1s biggest limitation. But dont think it wasnt dynamic. Listening to Non Allegro, the first of Rachmaninoffs Symphonic Dances [CD, Reference Recordings RR-96CD], I was amazed at how loudly the little B1s could play. They created a nice, wide soundstage in which the positions of instruments in the Minnesota Orchestra, under the baton of conductor Eiji Oue, were easy to pick out. The drum at the opening of Non Allegro still struck with plenty of impact, and was joined by the powerful sound of the brass section as the dance quickly builds in intensity. The B1s greatest strength here was its ability to hold everything together and remain coherent. Despite large dynamic shifts in the performance -- something that Reference captures wonderfully -- the B1 always sounded composed and quick. Brass instruments were never etched or hard, but always sounded pleasing and in balance with the rest of the music. The wind instruments and strings in Non Allegro floated above the speakers with a delicacy that delivered these passages in a manner almost soothing. When I listened to Elliot Smiths posthumously released From a Basement on a Hill [CD, Anti 86741], the acoustic guitar in "Last Hour" had good detail; the sounds of Smiths fingers moving along the fretboard were clearly audible through the B1. The body of the guitar resonated warmly, giving it weight and presence in the room. Smiths John Lennon-like vocals are beautifully captured on "Little One"; this and the accompaniment give this dark song an almost fairytale atmosphere. Here, too, the B1 performed exceptionally well, sounding much more open and clear than its low price might indicate. The B1s again displayed the qualities cited above when I played Loreena McKennitts newest disc, An Ancient Muse [CD, Quinlan Road QRCD109]. "The Gates of Istanbul" was reproduced across a wide soundstage; at times, the exotic instruments played on this track and throughout the disc extended well beyond the speakers outer edges. The wonderful reverb surrounding McKennitts voice on "Caravanserai" was again immersed in a huge soundstage of enormous width and a good sense of depth. As before, instruments were easy to locate, and the song was beautifully rendered overall, with excellent detail, spot-on tonal balance, and well-defined imaging. While the depth of the B1s bass wont rival that of bigger, more expensive speakers, I was quite taken by its control in the bottom end. As well, the pair of them had an accurate tonal balance that made voices and instruments sound wholly natural, and an ability to reveal a good amount of detail while creating a well-defined soundstage in which individual musicians were easy to pick out -- all in all, outstanding performance for speakers that cost less than $300/pair. The speaker Im most familiar with is PSBs Platinum M2, a pair of which I own. Theyre not only my reviewing reference, but the most expensive bookshelf model PSB makes. The M2s price of $1999/pair -- over seven times that of the B1 -- might make a comparison seem unfair; youd expect the M2 to outperform its smaller sibling, and it does. Its also better built -- as youd also expect. Still, the comparison shed some insight into the character of each loudspeaker and showed how much of the M2s sound the B1 could actually achieve. 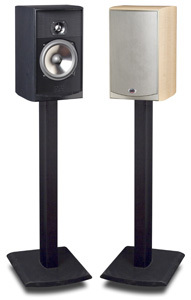 Like every Paul Barton speaker, the B1 is designed to be neutral, and in that the sounds of the B1 and M2 were similar. However, the B1s midrange was a bit more forward, which had the effect of bringing performers forward, closer to my listening chair. I heard this while playing "Twilight," from the Elliot Smith album. Through the B1s, Smiths voice emerged from just above the tweeter and close to the plane of the speakers. Through the M2s, he sounded farther back, as well as a bit less forced and more natural. The B1s pleasant and somewhat warm sound worked very well with inexpensive electronics, but it was a departure from the extreme neutrality of which the M2 is capable. And finally, the M2 plays deeper in the bass and is capable of producing higher output levels -- hardly surprising, given its larger cabinet and woofer. However, these are the sorts of differences youd expect from speakers so far apart in price, and hardly reflect any shortcoming in the B1. If youd never heard a speaker of the M2s caliber, you might not even know that these sorts of subtleties exist. The sonic differences between these speakers arent nearly as vast as the difference in their prices. For a fraction of the M2s cost, the Alpha B1 is an amazing performer. In my opinion, the category of under-$500/pair loudspeakers is the most important in the industry -- someone buying his or her first stereo system probably wont spend much more than $1000-$2000 for everything, and would expect the speakers to cost no more than $500. If that audio newcomer finds the system musically satisfying, he or she could develop further interest and consider exploring different, inevitably more expensive gear. At least, thats how I got started. Basically, this price category of speakers attracts first-time buyers, and has the potential to turn them into long-term enthusiasts. At just $279/pair, the PSB Alpha B1 is an excellent entrée to the world of hi-fi. This little speaker is an easy choice for those who want to assemble inexpensive systems that theyll enjoy for a long time to come. The B1 offers across-the-board performance that compares to much more expensive speakers, offers much more than a hint of what Paul Bartons best designs sound like, and is a continuation of PSBs tradition of offering exceptional value for money. For what the B1 costs, there should be a pair in every home.